Image scaled down from 810px to 740px wide. Click the image to view the original. Sue, mine was purchased brand new, December 1982, and is as good as new. I shall be publishing some pictures of it soon. Thanks for mentioning Suzanne. Is the label readable in your Suzanne nylon Pakamac, Brian? I wish that I had photographed mine before I soaked the mac. I have a "Suzanne" nylon mac too. Mmmmm! I recently bought a ladies genuine nylon Pakamac and just as I remembered and incidentally commented on here some years ago, the ladies macs were indeed given women's names for the style. There in one of the pockets was the label stating the style Suzanne. Also, there was a date, stating May 77. I can only assume that this was the production date. Unfortunately, I had broken one of my rules about buying clothing, the mac had been used before, many times. I never ever wear second hand but the lure of Suzanne was too irresistible. I consigned it to a soak in biological washing liquid and an antibacterial washing liquid overnight. Hanging in a stiff breeze the next day, the Pakamac dried in no time. The result? Beautiful. Stains gone and a pleasant aroma. Sadly, the pocket style tag had faded almost completely. However, the Pakamac is an absolute delight to wear bringing back all the lovely memories of when I was younger and used to leave a shop in one, having just bought it new. In fact it was better, perfection indeed. The way it looks over a matching dress is fabulous. Buttoned to the neck, it feels and looks wonderful. It struck me too, just how well made they were and judging by the date, just how rubust they were compared to nylon macs of the 90s. Rather than just selling it on, it has become integral to my wardrobe, a favourite and one that I take everywhere. Please guide me to Jean's photo's. All pictures of Sue are fantastic. All pictures of Jean are fantastic. Hi, in the late sixties/early seventies my dad had one, I had the more usual plastic only sort. I don't think he liked his that much, but it was practical and much stronger that the ones I had. But for me, I just loved them, and still do, please email me if you would like to chat. 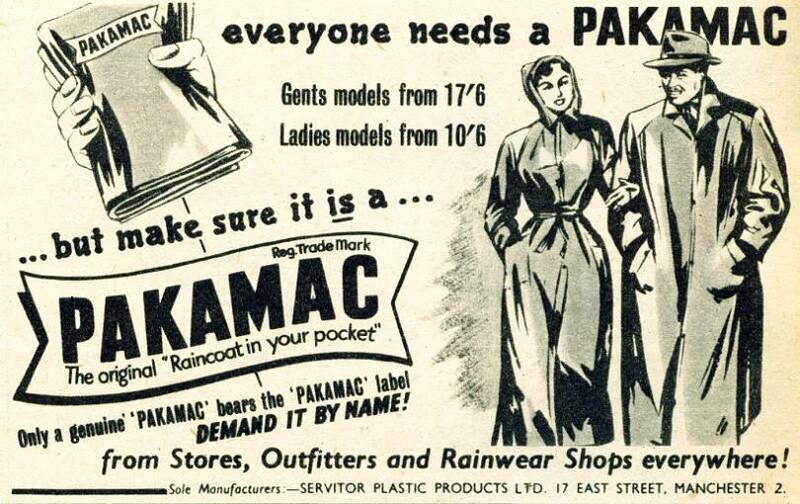 Does anyone know when Pakamac Ltd were producing their men's nylon reinforced PVC raincoats? I noticed that there was one for sale recently, on eBay. I bought all my lady's navy blue nylon macs from high street shops, up until about 12 years ago. After a while, there was no need to even try them on as the sizes were perfect. Fortunately, I still have a lot of them. It must have been about 30 years since I bought one from C&A. Their styles used to be somewhat different to other shops. Lots of lady's navy nylon macs on e-bay, so important for me. I am so glad I bought most of my female macs in the 1980s-not least from C & A. This store was terrific. wish i had bought up lots of plastic macs in 1980s when they were new for about 7 pounds. Bev. Hopefully, Susan, it'll be someone like us. Well, I was unable to buy the plastic mac that I wanted so I'll have to go with the alternative. The one I wanted was a hardly worn genuine Pakamac in leopard print plastic. Did anyone else see it or bid on it on eBay? Why couldn't I buy it? Well, the final bid of £103 took it well out of my range. Who is buying all these? Where are they disappearing off to, never to be seen again? Heavens yes Brian, I am an incorrigible plastic mac and nylon mac wearer. I think that I've been incredibly lucky to have bought three gents plastic macs this year at what would seem to me, cheap prices. If only I had the foresight to stock up on them 40 years ago! You know me though Brian, I couldn't have resisted wearing them. You are indeed correct Brian. I've already ordered a new plastic mac on eBay, which should arrive next week. As well as that, I have my eye on another plastic mac. If that bid is unsuccessful, I have a back-up option that I'll order later. I agree Jeff and Ken, those prices are a bit steep. If it's any consolation, I paid over £80 for a much sought after plastic cape, some 10 plus years ago. Yes Brian, I am incorrigible. Hi Ken, I agree, the total cost is extortionate. Long gone are the days when you could buy a plastic mac for 17s/6d. PVC-U-Like make a gent's plastic raincoat but they are about £50 plus the postage. Thanks for the response, Jeff! I have 3 male Jeantex plastic macs, all dark blue, with a violet tinge, and a delightfully rubbery texture. When held to the light, they are slightly translucent. I also have a lady's Jeantex mac, and this is indeed clear and natural. It is beautifully oversized too, ideal for outdoor use-and dating! Soon be autumn, and the season for wearing nylon macs-and, oh dear, I will be ordering more-just like my friends Sue and Jean. We are incorrigible-and we just love it! Hi Ken, they are really nice macs, I have 3 of the "Toni style" raincoats as well as a Jeantex "Frank style" hooded jacket and a Jeantex see-through poncho. Unfortunately, I suspect that Jeantex no longer make any see-through plastic rainwear although I may be wrong. However, there are similar items manufactured under the brand name "Pro-X Elements". Their styles are "Fred", which is a gent's raincoat, "Bess", which is a ladies raincoat and "Dublin" which is a unisex poncho. It seems that these items are only available from Germany and postage makes them quite expensive. Try googling "Jeantex Toni", you may be lucky. Also, try googling "Pro-x Elements Fred" or "Pro-x Elements Dublin". Hope this helps, Jeff. Hi Jeff may I ask you were did you buy your plastic Mac I would love one . Hello Brian, glad to see that someone else enjoys wearing their Jeantex plastic mac. I wore mine a few times last week while on holiday in North Devon. Mine is natural, see-through plastic, you say that yours is slightly see-through. Is yours natural too ? I just keep buying them. I just love them. What shall I do? great to get out in the rain today walk round to shops with nylon mackintosh on with rain pattering on my hood. Thank you Old friend. You know how much I enjoy wearing them. I have never seen a transparent plastic mac been worn better than Susan does its fantastic I challenge anyone to find a better one. SUSAN DON'T KNOW HOW YOU CAN RESIST TRYING ON YOUR NEW PLASTIC MACKINTOSH. MADE IN TAIWAN BRINGES BACK HAPPY DAYS I BOUGHT LOTS OF THOSE FOR MY LATE WIFE UNTILL THEY DISAPEARED FROM SHOPS ABOUT 1993. One of my genuine plastic Pakamacs also says 'Made in Taiwan' on the inside label, Jeff. It's a style and quality that I remember buying in the 1970s. I haven't tried it on yet, it still has all the tags and is in it's, albeit battered, original bag. If my memory serves me well, I'll have to be careful when I put it on, because the buttonholes tore so very easily. My other two genuine plastic Pakamacs say 'Made in China' on the inside label. They both have a fly-front, which I didn't recall from my younger days. I can only assume that they are a later manifestation and production moved to the Chinese mainland. It surprises me that with the profusion of cheap plastic macs on offer these days, aimed primarily I believe at outdoor festival goers, that some enterprising Asian business hasn't started trading under the Pakamac logo. Heavens, I have surprised myself, as all these macs were bought only this year, just how much I adore the feeling of wearing an actual GENUINE PLASTIC PAKAMAC. sitting in garden nothing on but my sundress. sudden high wind thunder and rain. so in mackintosh on hood up. put car in and sun lounger away. sadly rain soon stopped. bit more later but not much. I keep being draw to my rubbery, plastic, slightly see-through Jeantex mac, which rolls up beautifully to Pakamac size. I wonder why.........? I have some twenty pac a macs. Two of which are Pakamacs, two from Chariot, a few others who's name escapes me, and four by Dunn &Co.
Susan your photos are fantastic the. transparent plastic macs are mind blowing. Hello Susan, I have a pale blue translucent plastic mac, the label says it is a genuine Pakamac but made in Taiwan. Probably, production would have ceased in the Manchester/Chadderton by then and moved to countries where labour was cheaper. How many of us out there actually own genuine Pakamacs? I have four in total amongst my larger collection of plastic macs and nylon macs. Three are plastic macs and one is a nylon mac. There is just something extra thrilling about wearing a genuine Pakamac. I know it's all in the mind because I have different plastic macs and nylon macs which I much prefer, but knowing that the mac I'm wearing is a Pakamac, adds so much more to the experience. Hi Hugh you are quite right but to see ladies wearing nylon macs is heartwarming hopefully it will continue leave your mobile number be good to chat with a Mac lover. Well Ken my hopes aren't that high for the return of the mack but as long as we have people like you and me who still enjoy them and can share our thoughts and experiences, I will be quite happy. And where might we see these magical women in in nylon mack's? I think we are all in despair, Beverly, with this most awful weather. Thank heavens for our lightweight mackintoshes; they are bearable after dark when it's cooler. NOT GOOD MACKINTOSH WEATHER AT PRESENT. PUT MY ON WHEN SITTING IN GARDEN WHEN GETS COOL IN EVENING. So wonderful to see that nylon mackintoshes are back on the agenda.